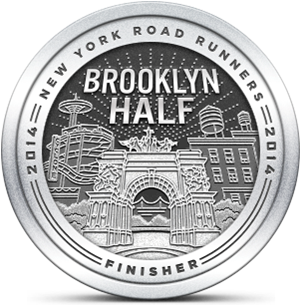 The Brooklyn Half will happen in less than 24 hours. This will be my third half marathon and my first NYRR race. My training for Brooklyn started well and stayed on track until I accepted a full time position on top of my consulting practice. This caused my training program to go off the rails. However, until this week, I did manage to maintain my targeted weekly mileage. Today is dark and gloomy and heavy rain is predicted for a good part of the afternoon, going all the way past midnight. Better that happen today than tomorrow. I'm working from home today, which will involve a busy morning. Later in the day I'll turn my attention to preparing for the race. The increased security practices that have been put in place after the 2013 Boston Marathon are restricting what can be carried to races. I need to figure out my gear strategy since the only acceptable bag for race transport is being distributed today at the pre-race party that I cannot attend. Fortunately, SIOR and her entourage will be able to hold our stuff and hopefully get it to us at the finish. I'm looking at tomorrow with a combination of excitement and curiosity, although I'll admit to being a little nervous about the logistical complexities. I also need to run 13.1 miles in the morning. I've done it before, and my weekend base runs should have prepared me for that distance. The last time I ran a half marathon was in 2012 and I managed to meet my performance goal. Unless I find some unexpected strength and energy that will allow me to maintain a competitive pace, I will be running this race purely for the experience tomorrow. A large part of the excitement tomorrow is the shared experience. The Runsketeers (SIOR and TPP) will be there, plus friends LS, KWL, FS (among others). I've only run in Brooklyn once, when Adventure Girl and I crossed the bridge through DUMBO and then north to the water. I've always wanted to run in Prospect Park and, from the course map, it looks like I'll be spending more than half the race in and around it. Once we leave the park, it's a straight shot along Ocean Parkway. I hope the wind is coming from the north on Saturday! Until then it's waiting time. Morning will come soon enough and my friends will be at my house by 4:30 AM as we begin our journey to Grand Army Plaza. This should be fun. That course map looks suspiciously longer than 13.1 miles.